Does 1944 U.S. Military Report Prove “Comfort Women” Were “Just Prostitutes”? 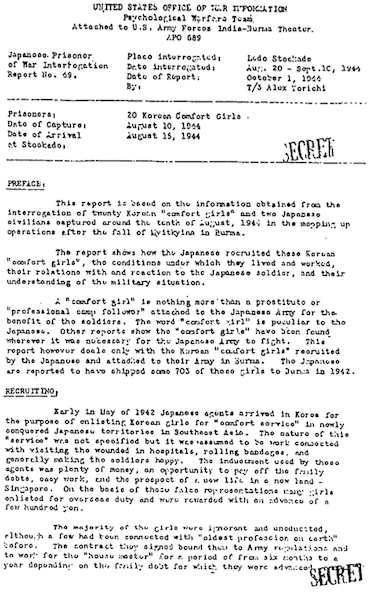 When Japanese politicians visited Glendale and tried to “convert” Japanese American leaders who had supported the city’s peace memorial dedicated to the victims of Japanese “comfort women” system of enforced military prostitution, the politicians presented a copy of a U.S. military report from 1944 that they believed would “prove” their position that “comfort women” were simply prostitutes who followed Japanese military for business. Their American apologists Tony Marano (a.k.a. “Texas Daddy”) and Michael Yon both cited the same document when they descended on our facebook page to argue the same thing. Clearly, they view this U.S. report as their strongest evidence absolving Japanese military of wrongdoings. Some of the Japanese right-wing nationalists cite this report as if it is a newly uncovered historical evidence, but it has been known among scholars of “comfort women” for more than 20 years. In fact, it was part of the supporting documents compiled by the Japanese government when then-Cabinet Minister Yohei Kono released the famous statement in 1993 in which Japanese government acknowledged responsibility for its direct involvement in the trafficking and exploitation of “comfort women” for the first time. While right-wing nationalists believe the report to be the “silver bullet” proving their case, scholars actually consider it one of many documents that prove Japan’s culpability. Right-wing nationalists are correct that the U.S. military report describes a “comfort woman (girl)” as “nothing more than a prostitute.” But in the next paragraph, the report details how “comfort women” were taken from Korea under false pretense (offer of a good job) and placed in a situation that they could not escape from due to debt. Also according to the report, most “comfort women” were never involved in prostitution prior to arriving at Japanese military “comfort stations,” and many were considered “underage” under the International Convention for the Suppression of the Traffic in Women and Children of 1921, which Japan had signed. “House masters” took 50-60% of the fees paid by Japanese soldiers, depending on the amount of money the women owed. Women also had to purchase food and other necessities from the house masters, which “made life very difficult for the girls” because house masters often charged excessively high prices for these necessities. We find these descriptions believable because they are very similar to how contemporary human trafficking cases look like. The report also states that women had the freedom to refuse customers, for example when a soldier was extremely drunk. But even if it were true, they obviously did not have the freedom to refuse the “job” altogether and leave because they were taken far away from home in a foreign land and had to repay their debt, which was made difficult by the fact that they had to pay excessive prices for food and other necessities in order to survive. To understand why the report seems to contain such contradictory information (did “comfort women” lived in near luxury, or had difficult life due to economic exploitation? ), we need to understand the context and purpose of the report itself. The report’s author is Alex Yorichi, a Japanese American soldier working for the U.S. Army’s Office of War Information, Psychological Warfare Team. Yorichi was tasked with finding out the effectiveness of Japanese-language leaflets that the Psychological Warfare Team had distributed in Japanese-occupied territories in Burma, and interrogated “comfort women” and their “house masters” as part of that investigation. A copy of the U.S. military report is available for download here. I am so happy that this “Texas Daddy” finally get busted. I hope he puts the paper bag over his own head so he can hide, hide from shame. This man made me so terrible sad and angry at the same time.Shame on him. I was never in doubt that the truth would prevail., sooner or later. Also according to the report, . . . many [of the comfort women] were considered “underage” under the International Convention for the Suppression of the Traffic in Women and Children of 1921, which Japan had signed. The interrogations show the average Korean “comfort girl” to be about twenty-five years old, uneducated, childish, and selfish. Thank you for your comment, but no, it’s not an error. The international law at the time prohibited the use of women and girls under 21 for the purpose of prostitution even with their apparent consent. The report contains a list of the 20 women interviewed by the U.S. officer, along with their age at the time of the interview. Based on that list, we know that 12 out of 20 were underage at the time they were taken to the “comfort station” (two years prior to the interview) to serve Japanese soldiers. You are correct that Japan made two “reservations” to the 1921 convention upon ratifying it: first, Japan defined minor as younger than 18 instead of 21, and second, Japan declared that the convention would not apply to its colonies. But that does not negate what we wrote above. The fact is, Japan withdrew the first reservation in 1927 after facing criticisms from the Privy Council (Sumitsuin), officially defining minor as younger than 21 for the purpose of this convention. Also, while the convention did not apply to Japan’s colonies due to the second reservation, the “comfort women” were transported and housed by the Japanese military, making the convention applicable to them because they were in the custody of the Japanese military.